Four drawings of details of carvings on the Dhamekh Stupa at Sarnath: The west niche. bl.uk > Online Gallery Home	> Online exhibitions	> Asia, Pacific and Africa Collections	> Four drawings of details of carvings on the Dhamekh Stupa at Sarnath: The west niche. 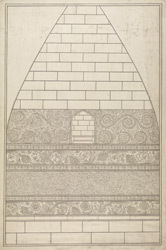 Drawing of the west niche of the Dhamekh stupa at Sarnath, by an anonymous artist working in the Calcutta style, c. 1785. Sarnath is the sacred place of pilgrimage for Buddhists in India as it is where the Buddha preached his first sermon in the 6th century BC after he attained enlightenment. The Dhamekh stupa, a cylindrical tower more than 30 metres high, marks the site of the sermon. The present structure dates to the 5th century AD and is decorated with Gupta designs incised high onto the dome. The incised motifs includes geometric patterns, foliation with stalks, leaves, flowers and birds.